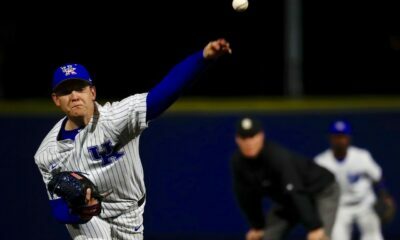 LOUISVILLE, Ky. – Defensive miscues undid Kentucky in the opener of an eight-game road trip as the Wildcats dropped an 8-3 decision at No. 10 Louisville on Tuesday night at Jim Patterson Stadium. The two-week stretch away from Lexington continues this weekend at Missouri for a three-game series. 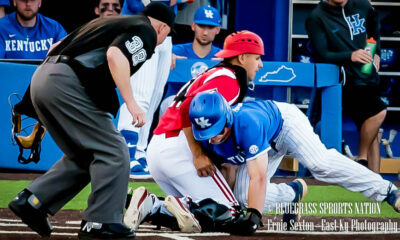 Louisville benefitted from three errors on the Wildcats, scoring six unearned runs in the game. The mistakes came on the heels of the Cats (16-13) seizing momentum with a pair of runs in the third inning to take a 2-0 lead. Junior T.J. Collett lined a two-run single to right field to score sophomore Coltyn Kessler, who had doubled to open the inning, junior Zeke Lewis. Collett later added an RBI single for his ninth multi-RBI game of the season and stole the first base of his career. 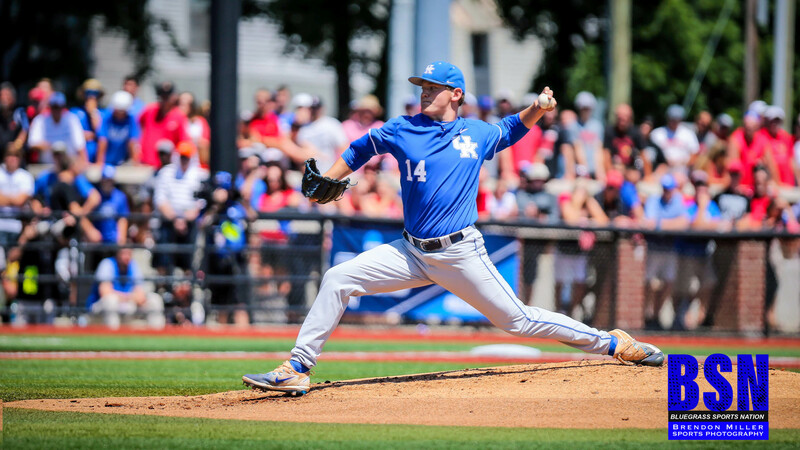 Starter Mason Hazelwood needed just 12 pitches to get through the first two innings but was undone by defensive miscues in the third and fourth innings as Louisville scored five unearned runs in those two frames. 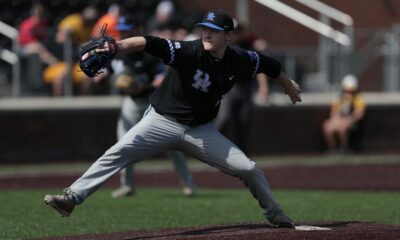 The sophomore left-hander’s final line saw him yield just two hits and strike out three in 3.0 innings but also allow four runs (one earned). Freshman Austin Schultz smacked a double to the wall in right-centerfield to open the eighth inning, extending his reached base safely streak to 19 consecutive games. It was his fourth double of the season. The game was UK’s 13th against opponents in the Top 25 of the RPI, the most in the country. It also marked the 13th game against teams ranked in the nation’s top 13. Top 3rd– Coltyn Kessler doubled to LCF, Zeke Lewis walked and Ryan Shinn was hit by a pitch to load the bases. T.J. Collett singled to RF, scoring Kessler and Lewis. UK 2, UL 0. Bottom 3rd– Drew Campbell reached on an error and scored on Ethan Stringer’s double into RCF. Jake Snider tripled to RF, scoring Stringer. UK 2, UL 2. Bottom 4th – Logan Wyatt reached on a fielding error and Alex Binelas walked. Wyatt moved to third on a wild pitch. Zeke Pinkham singled to LF, scoring Wyatt and moving Binelas to third. Campbell walked to load the bases. Stringer was hit by a pitch, Binelas scored. Snider singled to RF, scoring Campbell and Stringer. UL 6, UK 2. Bottom 5th – Binelas reached on a fielder’s choice and moved to third on Pinkham’s single to RF. Campbell doubled to LCF, scoring Binelas. UL 7, UK 2. Bottom 6th – Snider and Oriente walked. Binelas reached on a fielding error, Snider scored. UL 8, UK 2. Top 8th – Austin Schultz doubled to RCF, moved to third on Shinn’s deep fly to RF and scored on Collett’s single through the right side. UL 8, UK 3. 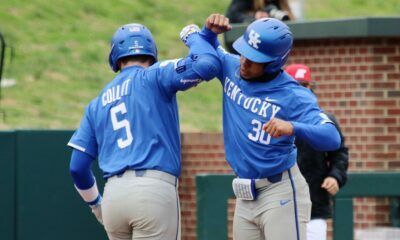 · Kentucky has scored in 93 consecutive games and 169 of the past 170 dating to the 2016 season. The lone shutout came in a seven-inning game. The current streak now is the the fifth-longest in school history and just one behind two streaks of 94 straight games. · Freshman IF Austin Schultz extended his reached base safely streak to 19 games with an eighth-inning double. · Junior 1B/DH T.J. Collett went 2-for-4 with three RBI and a stolen base. o Collett recorded his eighth multi-hit game of the season and 18th of his career. o It’s the fourth time this season Collett has driven in three or more runs. o He has a team-high nine multi-RBI games this season and 21 in his career. Kentucky heads back on the road this weekend as it takes on Missouri in Columbia. Friday night’s game starts at 7:30 p.m. ET and airs on the SEC Network Plus. Audio coverage on UKathletics.com.